Mauro Serra’s Hearts on Fire Wrapped on November 24th, 2012 and by all appearances was a rousing success. With one card down it looks like Mauro Serra will once again don the promoter’s hat in the near future and promised bigger and better things to come. But by no means does that mean he’s called it a wrap on being one of Italy’s busiest Thaiboxers. 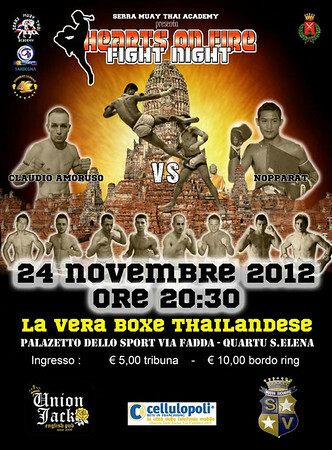 Some footage of the event has even started to appear featuring the main event of Nopparat versus Claudio Amuroso. ~ by fatsoking on November 27, 2012. The trailer is sinicnkeg a room full of adult men in a cheering and betting frenzy as they watch two 8 year old girls pummel each other.Not sure what is the saddest part that reality or the fact that the girls think their participation in the fight is noble because that’s what they have been taught to think by their own families.WOW!